The gods of college radio, R.E.M. bubbled up out of the cauldron that was Athens, GA, in the 80s. They got signed to indy label I.R.S. and burst out with one of the best rock albums ever recorded, Rolling Stone's 1983 best album of the year, Murmur. And I Feel Fine: Best of the I.R.S. Years 1982-1987 draws heavily on Murmur and its follow-up, Reckoning, making it a much more valuable compilation of the wonder that was early R.E.M. than 1998's Eponymous - and not just for the choice of material. The sound quality is light years better. But forget all that, and understand this: Pay the extra bucks and get the Collectors Edition. The second disc is absolutely loaded with demos, b-sides, and live cuts, and all kinds of great material. And then, what the hell, go get the companion DVD, When the Light is Mine... The Best of the I.R.S. Years 1982-1987 Video Collection, too - lots of stuff there I've never even heard of before, let alone seen. 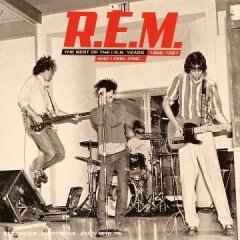 These discs are absolutely golden for old fans (even if you already have most of it), and those who want to understand R.E.M. in the days before the line between "indy" and "mainstream" got blurred. Complete CD and DVD track listings under the jump.